About two months ago, a friend of mine quit her job. It wasn’t planned or calculated. She had gotten on a routine conference call and when some work decisions came up that she didn’t agree with, she suddenly felt something inside of her tell her that this was no longer the job for her. She turned in her resignation on the spot. And as she did she was filled with the weird sensation of feeling invincible and relieved at the same time. An overwhelming peace rushed over her and she felt oddly calm even though she had just radically shifted her life. It was a feeling that confirmed in that moment that she had made the right decision. But as time passed, so too did those feelings. In the weeks that followed she predictably started to ride a roller coaster of emotions. The adrenaline of that moment had long since evaporated into thoughts of doubt and guilt, and she began to regret making such a rash decision. I have been fascinated with these moments of inspiration for a long time. These feelings in your gut that bubble up out of nowhere and tell you to do this or that. I have felt this spark many times. Sometimes it has told me big important things like “marry her” or “take that job” but mostly it tells me smaller things like “introduce yourself to that person”, “go on that retreat”, or “eat lunch at that place”. No matter how big or small though, every single time I follow this guidance something unexpected and positive ALWAYS happens. Sometimes it has helped me meet incredible people and presented life changing opportunities. Other times it has simply given me an encounter that put a smile on my face and reminded me of this amazing gift I have called life. The crazy thing though is that I still choose to ignore these glimpses of inspiration more often than not. I’ve become habitually more comfortable with the security of the path that I can control in my head, instead of choosing the path leading me into the unknown. I’ve tried to figure out why I wouldn’t do something that always has positive benefits, and as I pondered that question a friend of mine recently reminded of a time one of my boys decided to follow his gut instinct. So I decided to try to analyze my son’s experience in an effort to help me understand these divine moments a little better. In late October I picked up my two oldest boys, Patrick and Will, from school. As they walked to the car I could tell Patrick was excited about something as a huge smile was plastered across his face. As soon as he got in the car he shouted with enthusiasm “Dad I signed up to do Devos!!!”. He told me it stood for Devotionals and was where you stand up in front of the whole middle school and give a speech about your relationship with God. I didn’t say anything, but I kind of thought the same thing. Patrick quickly dismissed Will’s questions, and in fact the next day he hopped in my car with the same energy and excitement to tell me had also suddenly decided to run for Governor at an upcoming Youth Legislature Day. This would require another speech, again in front of a couple hundred people. He was clearly on a roll, and the news of his upcoming speeches spread like wildfire. Family and friends began calling Patrick to congratulate him on volunteering for Devos and Youth Legislature, and his teachers made a really big deal at school of him running for Governor. Patrick LOVED all the attention and applause he was getting. and was replaced with doubts in his head. He started to picture all the people that Will had mentioned that day in the car, and he wasn’t so sure that he really wanted to do this anymore. He started thinking more about how he could mess up, then how he could succeed. We started working on the devos speech at home and at school he began meeting weekly with his History teacher to work on his Governor’s speech. He began seeing how much work all of this entailed. If he’d known the work he’d need to do on the front end, chances are he never would have signed up for this. A scheduling conflict at the school pushed the Devos speech back to February and then back again till March. He would now give his devotional just a couple of days before he’d have to give the Governor’s speech. Each time the speech was moved, Patrick became a basket case. Part of him wanted to just do the speech and get it over with, and part of him wanted it to just be delayed forever. It seemed like an eternity had passed from the time he had signed up, but the week of his Devos speech finally arrived. Patrick’s vision isn’t very good and as a result he would have to memorize the entire presentation instead of being able to look at notecards to prompt him along. Just a couple of days before he would stand in front of the entire middle school his brain turned to mush, and he couldn’t seem to remember anything. He practiced over and over but never seemed to be able to make it all the way through the speech. He desperately wanted to give up, but the thing was he simply couldn’t. The teachers had re-arranged the school day to have this Devos talk, and Patrick was the only speaker. Nerves started to kick in big time and he barely slept the entire week. Getting out of the car on the day of the Devos Speech, Patrick nearly burst into tears he was so nervous. His doubts magnified to such a level that they became almost crippling, and each passing minute brought more ideas on all the ways he could mess up. But the moment finally came. His heart beating so fast that he thought it would pop out of his chest as he walked to the stage. It was as if the power that told him to volunteer for this talk so many months ago, suddenly showed up again and gave him the strength and composure to get through it. The words he had stumbled on so many times, now effortlessly flowed from his mouth. He was funny, he was honest, and he allowed himself to be completely vulnerable. 8 minutes later he would walk off that stage a different person, simply because he was now on the other side of fear. And on the other side of fear is ALWAYS something beautiful. A couple of days later he would go through the same cycle as he prepared for his Governor’s speech. And as he walked to the podium his nerves would be replaced again with the inspiration that filled his heart to sign up for this. He somehow beat out the other awesome candidates who gave great speeches, and was elected Governor by the 260 students that attended. He got to spend the next two days in a mock government where he was treated like royalty. After the speeches Patrick’s confidence soared as he was able to see a different side of himself. I knew these experiences provided an opportunity for my son to grow, but what I didn’t anticipate was the outpouring of love and support that came from all over the place. It’s been over 3 months since he gave those talks and I still get stopped on a weekly basis from people that tell me how touched they were by Patrick’s devos speech. Because of social media people have seen it across the US, as well as London, Canada, Paris, Germany, and Australia. I was told a family in India watched it, and locally the video was shown to several church groups. And then after he won the Governor’s spot at Youth Legislation a family member arranged for him to meet the actual Governor of Louisiana. We could have never predicted any of this back in October when he signed up for the speeches. Patrick did an amazing job with his devos speech, but it’s certainly not the greatest speech of all time. So, I wonder does the speech resonate with people because he is a kid that faced his fears and talked in front of a large group? Or does it resonate because he talks about the challenges with his vision and maybe people can relate to that in their own lives? I’m not sure, but the more I think about it, I believe it resonates with people simply because it was carried out through inspired action. For to be inspired means to be “in spirit” and therefore acting outside of oneself. These actions create a ripple effect that can only be caused by God, and the impact is so much greater then we can ever imagine. I think about my friend who quit her job by following her gut instinct in that moment. I talked to her recently and while she doesn’t have a new job, she is incredibly grateful for the time she has been able to spend with her oldest daughter before she leaves for college. She told me that that time has been more precious to her than anything. She is not sure where her path will lead, but her time with her daughter has renewed her spirit that she made the right decision. As I look back on my life and try to dissect some of these moments of inspiration, these gut feelings, I start to see that they are also the moments when I was pushed forward in becoming the person that I most want to be. They are the moments that make me feel so alive, and point out how numbing it is to live a life that is constantly guarded and controlled. They are the moments when I felt the divine grab my hand and show me the path. They are the moments that lead me into the unknown, and somehow the unknown always turned out better than I could have ever imagined. They are the moments that I hope to choose a lot more in the future. Traffic in Los Angeles is always bad. On this day though it seems as if all the delays that are normally spread across the city have been swept up and sprinkled solely around LAX. The airport shuttle inches forward slowly, grabbing every piece of concrete it can secure. A drive that should take only a couple of minutes has now lasted the better part of an hour and the terminals are still nowhere in sight. Exhausted parents try to calm their young children. Businessmen stare at their watches. The shuttle starts to feel like a powder keg of anxiety as the passengers quietly worry if they will make their flights. Everyone tries their best to suppress the scream that lies just below the surface. With each passing minute the tension becomes more and more palpable. It’s needed at this moment, and immediately cuts through the tension like a hot knife through butter. The laughter is deep and heartfelt. It comes from 3 college age girls towards the front of the bus. They talk amongst themselves and laugh more and more. Their laughter becomes infectious and grabs my attention. It won’t let go. I try to listen to what their saying but quickly gather that they’re not from here. I can’t figure out the language, maybe Turkish maybe Hungarian. I wish I had a better understanding of languages. But the language isn’t important. They continue to talk and laugh. As the shuttle inches toward the airport, I start to wonder whether they are starting a trip or ending one. But as I look closer at their faces I can see the tiredness that lies on the other side of their smile. They are no longer fueled with the excitement of adventure before them, but instead filled with the satisfaction of the memories they’ve made. Their clothing is outfitted from tourist shops across the country, and helps me to piece their journey together. An “I LOVE NY” wristband, a Statue of Liberty keychain on their luggage, a t-shirt with Chicago emblazoned across the chest, a hat with the Hollywood sign stitched across the top. A thought enters my head and I wonder whether they had fun on their trip. Whether they liked seeing the sites of this country. The sites of MY country. I suddenly feel vested in their journey, hoping that they loved this country as much as I do. Like recommending a favorite movie to a friend and wanting them to laugh and smile and cry at all the same places I did. I’m too far away to talk to them, to ask them about their trip, but I wonder what I would want them to see. How would I show them America? How would I explain this incredible country to them? My mind fills with images of landmarks, but I quickly dismiss them. Landmarks help to tell our history on the surface but don’t come close to explaining my love for the United States. Rattling off landmarks would be like using only my son’s hair color to try to fully describe what he means to me. The shuttle lurches forward and I become lost in thought of how to describe the feelings I have for my country? I imagine that if you asked a hundred people what makes this country so incredible, you would get a hundred different answers. I think of other things that I love with all my heart, and I instantly picture my family. And as this thought passes through my head I suddenly realize that words will never be enough to fully convey this feeling. I could write everyday for the rest of my life and I would still never be able to capture what my heart knows to be true. Describing the meaning of this country, becomes an impossible task. I am frustrated with myself, but give up on finding the perfect words to describe what it means to be an American. As I become lost in my thoughts, time has disappeared, and I am suddenly brought back to reality as the bus pulls up to the terminal. This isn’t my stop and my attention turns back to the girls. I watch as they lift their huge backpacks and get off the bus. Through the window I can see them still giggling, and I wish one last time that they saw the awesomeness of this country before returning to their own. I try again to formulate the perfect words in my head, but they don’t come. I watch as one of the girls says something to her friends and they all start searching for something. They look on each other’s backpacks, and then turn their attention toward the ground. They’ve lost something and they seem panicked. The shuttle driver starts to pull away from the curb and then suddenly slams on the brakes and hops off the bus. Through the window I see that whatever the girls had lost, the driver must have found. The girls take a second, throw their backpacks on and head into the airport. As they do I see that the thing they had lost is now sticking out of the top of one of their backpacks. It’s a small flag made up of red stripes, white strips, and fifty little stars perfectly distributed over a blue rectangular background. In that moment I realize that the American Flag has the power to convey all the feelings that I couldn’t in words. In that moment I know that the girls saw the America that I would want them to see. He is absolutely beaming today, because when he woke up this morning he turned 5. And being 5 years old is just about the greatest thing that you can be. You see when you turn five you can do things that just weren’t possible at four. Five year old muscles allow you to pick up things that you just couldn’t do yesterday as a four year old (Andrew quickly demonstrated with several pieces of furniture). As a five year old he can now run faster, throw a baseball farther, do amazing bike tricks, stay up later (not really) , jump higher, do awesome slides into second base, hold his breath longer, dunk a basketball (also probably no), beat his brothers at wall ball, do triathlons, hold a big boy cup with one hand (probably not a good idea), go to kindergarten, ride a real school bus…. Yep there is literally nothing better than being 5. Being the dad of 5 year old Andrew is pretty awesome too. which means that our family has celebrated several other five year old birthdays in our house. But with each passing five year old birthday, my appreciation and love of these moments has become stronger and stronger. Today I get to immerse myself in Andrew’s giddiness and excitement for all the new things that he can do. Because as I fully share in his joy, it makes me feel five too. which happens to be what turning 5 is all about. Yep, being 5 years old is just about the greatest thing you can be. 13 years ago today I became a dad to an awesome little boy. A little boy so tiny at birth that my wedding ring could easily go over his foot and slide all the way up his thigh, and so fragile that it would be more than a month before we could even hold him. It amazes me now to think that this teeny tiny little helpless baby has taught me so much about strength. Despite his tiny frame, Patrick has always had a physical strength that allows him to do countless pull-ups and glide effortlessly across monkey bars (107 times non-stop is his personal best). A strength that allows him to traverse up rock walls for hours and hours with a natural ease and grace to his movements. A physical strength that seemingly gives him the ability to run forever. At 13 years old, Patrick’s strength is his art, and it’s an incredibly beautiful thing to watch. Patrick also has an inner strength though that burns brighter than anything I’ve ever seen. As a result of his prematurity part of his vision was taken away, and when your eyes don’t work at 100% it means that every day life becomes exponentially harder to do. Small tasks like dropping a pencil on the ground require a ton of effort and focus, and at some point you have to accept that your 4 year old little brother will sometimes be able to do things easier than you. Despite all of the things that seem so unfair though, Patrick has this inner strength that constantly fuels his abundant love of life. A strength that at times seems to overflow from his little body and always allows him to see the good in other people. It is this inner strength that makes Patrick the strongest person I’ve ever met. Airport totally crowded. As I get ready to board two young brothers catch my attention. One is about 11 and the other around 7. I watch as they weave through the mass of people each with a violin case in their hands. The older brother suddenly stops, puts his case on the ground, pulls out his violin and is about to start playing. I’m about 50 feet away from them but I can see the little brother is suddenly struck with fear. His face goes completely white. The older brother leans down, I imagine offering some words of encouragement, but the younger brother shakes his head “no”. More encouraging words, but they’re not getting through, there is no way the younger brother is going to do this. Most of the airport is oblivious to the boys and their discussion, but I find myself completely entranced, rooting for the little brother to find the courage to play his violin. A couple minutes go by and the older brother finally decides to get down on a knee and plead with his little brother for the last time. This time something somehow resonates and the little brother very timidly and slowly pulls his violin out of the case. If there was a picture of fear in the dictionary it would be this little boy at this exact moment. The older brother starts playing before his younger brother can reconsider. It takes a second for both violins to hit the same chords and then suddenly “Silent Night” begins to float through the air. I watch as everyone in the airport stops and takes in this unexpected scene for the first time. The boys are really talented and their music seems to have the power to suddenly put everyone in a good mood. As the song comes to an end, the entire airport erupts in applause and I notice that the fear that was on the little brother just a moment ago has now turned to pure joy. The boys continue playing as more and more people start to gather around them. As I board my plane I watch the smile on the little brother’s face and think about how there is always something amazingly awesome and beautiful on the other side of fear, and hope that I have the same courage as those little boys next time I need it. Violence, Flooding, Death, and Destruction. These are the words used over and over in national headlines to describe the events in Baton Rouge this past summer. They are words that you hope are never associated with your city. Paralyzing words that add description to tragedy, while simultaneously breathing life into feelings of fear and anger. There is no denying that a truth lies in each of these words as they refer to specific events over the past two months, but they are also incomplete as they only tell part of the story. Hope, Belief, Compassion, Kindness, and Love. These are the words that paint a much fuller picture of this summer in Baton Rouge. These are the words that tell the story of the events after we buried police officers and watched floodwaters flow into every crevice of the city. There is no doubt I have felt immense levels of sadness and grief over the past two months, but as I reflect I know that I have also experienced equal amounts of compassion and love. For there have been many times when the sadness as real and tangible as it is, simply gets overpowered by enormous waves of hope as our community has united and unwaveringly decided to push forward together. Each time my heart has broken this summer; it has seemingly been mended with an exponential growth of pure love for Baton Rouge. 11 years ago we lost our home and all our possessions in Hurricane Katrina. It was a certainly a trying time but one that taught me that tragedy and disaster are not just the ingredients for sorrow and despair, but also a catalyst for the purest and best elements of humanity to rise up. I know that many tears are still left to be shed as people mourn loved ones and grasp the recovery in front of them. But I am also comforted by own experience to know we will get through it together. There is a beauty in the bravery it takes to not give up, to help one another, and know that you will succeed, and Baton Rouge has certainly let its beauty shine. This upcoming weekend my wife’s brother is getting married, and as the brother-in-law I’ve found that I am pretty much in the wedding sweet spot. I am close enough to the action to hear about plans being made, but far enough removed from the decision making that I can actually relax and enjoy it. As far as weddings go, I like this position, and it has given me time to think back on my own wedding and start developing an idea on what marriage is all about. 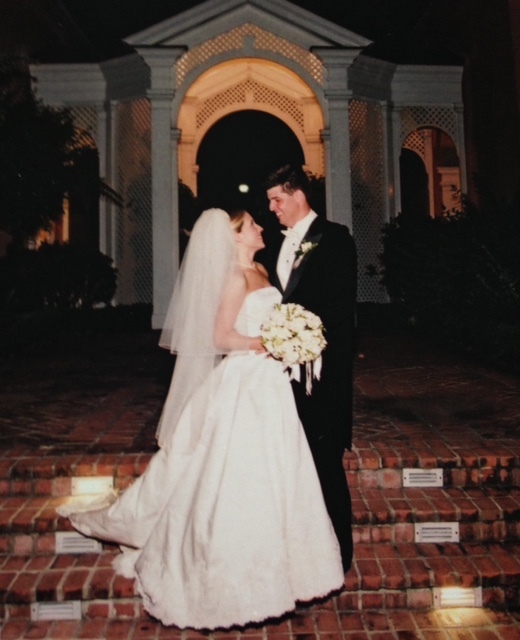 I’ve been married nearly 14 years, and can still remember being very excited about my own wedding, while also feeling unsettled with the fact that it seemed like such a grown up thing to do. I never doubted who I was marrying (she’s ridiculously amazing), but that I would actually be able to do this, to be a good husband. It was the same sort of doubt I felt several years later when I became a parent. I’ve noticed that’s how life seems to work though; always putting you on an adventure you don’t feel fully prepared to take on (which coincidentally also happens to be the plot line of all of your favorite movies). Nearly a decade and a half later the minute details of my wedding day have been replaced in my memory by snippets of the most important parts: my wife walking up the aisle, my father-in-law crying as he handed over his daughter, a hug from a groomsman, and of course me totaling my mother-in-law’s minivan two hours before the wedding (yep, that actually happened). As my brother-in-law and new sister-in-law’s nuptials approach, I think about what I have learned over the past 14 years and what piece of advice I could share. To be honest I feel weird giving advice as I am still trying to figure things out myself (I’m a very slow learner). So with that I figured I would share an idea that I have been working on. Something to just chew on and let simmer for a little while. Something that is taking a little while moving from my head to my heart before it can become a concrete truth. The idea is that marriage is actually about creating a partnership in helping you be you. Maybe that sounds obvious, maybe it doesn’t. It didn’t to me for a very long time. Collectively you are working as a unit, but the success of the unit depends on the work of the individual. Your spouse is there to enhance yourself, not to fix all your problems. On the good side you have someone along for the ride that is trying to encourage you to pursue your dreams and do the things that only you can do. On the flip side it also means that you have a lot of work to do on your own, which can either be empowering or deflating. The empowering part is fun and exciting and needs little explanation. It’s easily felt and can be spotted surrounded in hugs, kisses, laughs, high fives, etc. The deflating part though is typically where I have struggled. Under this idea it means that when something isn’t quite working I have to point the finger back to myself (which is never fun), instead of the easier alternative of pointing it at my wife. I know, I know, this is the part where the idea needs a little time to percolate and take shape. Over the past 14 years we’ve hit a rough patch here or there, and what I’ve noticed is that most of these patches seem to coincide with me dealing with some type of internal issue. With just me struggling to be me, and less to do with the fact that someone just ate the last piece of cheesecake (though maybe sometimes it is about the cheesecake). I think that we are constantly experiencing new things, which forces us to constantly change, constantly evolve, (as proof, I would have never considered writing a blog post about marriage even 5 years ago). The difficult part of marriage and relationships as a whole is that everyone is kind of in a different spot in being themselves. When people feel a little off, I think they feel as though something is missing and do everything they can to fill that gap from the outside (from binge watching The Real Housewives, to changes in career, to alcohol, infidelity, and everything in between), which pretty much never solves the issue at hand. So as a spouse you then have to figure out when to give your significant other the space he/she needs and when to step in and help them get back on track, while at the same time doing the same thing for yourself. This then is the trickiness of marriage, because there is no one hard and fast rule to tell you when you to do this, or at least I haven’t discovered it yet. So like everything else you just try to wing it, and figure it out as you go along, as you learn more and more about each other. As you learn more and more about yourself. The months and months of planning leading up to this weekend’s wedding will come and go in a blur. It will be absolutely awesome, and in the end our family will officially grow by one. I don’t know if my idea on marriage will help the newlyweds as they start their new life. Like most ideas, this one has pros and cons. It’s certainly not filled with answers for every occasion and has holes that still need to be thought through. Even after 14 years in the trenches, I’m still very much an amateur on every level, but the more I apply this idea and think about it, the more it just feels right.